Our prime minister's toe-curling performance in South Africa has done little to distract those who are wondering why she has travelled thousands of miles to announce a trade deal which isn't worth a fraction of the value she seems prepared to throw away when we leave the EU. Yet, alongside embarrassing the nation with her lack of dignity, she managed to show judgement every bit as crass, telling us that a "no deal" Brexit "wouldn't be the end of the world", apparently seeking to downplay Philip Hammond's warning from last week, when he suggested that "no deal" would add £80 billion to the government's borrowing requirement. With that, though, we might be seeing something of a picture emerging which might explain where government policy is taking us in the last stages of the stalled Brexit negotiations. For this, we can take as our starting point Mrs May so-called "Chequers Plan" which even she must have realised isn't going to play well in Brussels. With Macron now asserting that protecting the EU's unity is more important than a strong relationship with the UK, it must also be obvious that she is not going to extract any last-minute concessions from EU members. On the other hand, she must be aware that if she tried to make any further "concessions" to Brussels in what is already considered a "sell-out", that will provoke open rebellion from the "ultra" wing of her party. A move closer to a "hard" exit can also be ruled out. Not only would that infuriate the Hammondites in the party, it would almost certainly mean it would be rejected by parliament in a vote. In the event that we did crash out of the EU as the result of deliberate policy, the Conservatives would suffer the electoral fall-out which threatens to be so severe as to keep the party out of office for a generation. Putting this together, we have a situation where Mrs May is truly locked in an impasse. She cannot offer Brussels a workable plan, nor can she be seen to take us out of the EU without a deal. Either move would split the party, while the inevitable consequences of a "no deal" would have serious effects on her party's electability. If that is a correct appreciation of the situation, there seem to be few options left to the prime minister which would satisfy the demanding requirements of keeping the party together and ensuring it is still electable at the next general election. However, just because Mrs May might have very few options doesn't necessarily mean that she has totally exhausted all possibilities. And, without having any "insider" insight, it is possible to devise a scenario which had a chance of squaring the circle. In her position, what I might do is engineer what appeared to be increasingly frenetic talks, interspersed with unremittingly optimistic predictions of imminent success, all with the purpose of giving the impression that the government is actively engaged in seeking a viable solution to the Brexit process. To the very last, Mrs May will maintain that it is possible to agree a "good deal" with Brussels, as she has done in South Africa..
To parallel this, I would have her working on her own personal "backstop", which would have nothing to do with Northern Ireland. This would have two elements: firstly, Mrs May would encourage – via allies and through other means – the view that there was no great peril in a "no deal" scenario. This explains her intervention as she flew to South Africa, when she came out into the open to downplay the consequences of a "no deal", conceding just enough pain to make some warnings plausible – with the comment that it "wouldn't be a walk in the park". Nevertheless, to convey the impression that warnings have been exaggerated, she balanced this with the upside, asserting that Brexit could still be an economic success, even "if it proved impossible to negotiate a satisfactory divorce". And this brings in the second part of the ploy. Here, Mrs May's allies (such as the IEA) will be encouraged to make the case that any harm coming from a "no deal" Brexit will only arise from deliberate action from the EU. Parties acting "reasonably" – the narrative goes – will be able to solve any problems without any great inconvenience or disturbance. Thus, anything that happens will be the result of the EU "punishing" the UK. Clearly, that narrative is already in the process of being established – with the willing assistance of a conformist media. The latest tranche comes from The Sun, which breathlessly informs us that the "real reason" Brussels wants to reject Theresa May's Brexit plan is that "it will save UK businesses billions". Next in my scenario is to ensure is that the Brexit negotiations go right to the wire. Despite protestations indicating a desire to wrap up early, the trick will be to keep the talks going to the eleventh hour on 29 March 2019. Any concerns about ratification can easily be resolved by the promise of an application for an Article 50 time extension, sought solely for the purpose of allowing the European Council and Parliament to approve any putative deal, and for Westminster to cast a "meaningful" vote. The European Council, we will be told, could hardly refuse. Of course, this will never happen. At the very last minute, despite the heroic intervention of the prime minister who will jet out to Brussels in a final bid to broker a resolution - amid a glare of publicity – the effort will come to naught. And when Mrs May fails to return waving aloft "a piece of paper" in her hand, it will be game over. At the witching hour (Brussels time), the UK will drop out of the EU automatically. We will be on our own. Having left it to the last minute, this means that nothing will go to Westminster for a vote, and there will be no chance of a referendum. The "no deal", will be a done deal, so to speak. There will be no need for the divisive inconvenience of a vote. Then the final phase of my "plan" will kick in. Mrs May and her supporters will move into high gear to blame the failure of the talks on the "intransigence" of Brussels. Relying heavily on the drama of her last-minute dash to Brussels, she will make out that she was "this close" to a deal. But for the EU pulling the plug, she could have carried off a famous victory. "It's not my fault guv", will be the phrase of the hour, repeated endlessly to drown out the protestations of the "colleagues". Positioned such, Mrs May can cast herself (and the UK) as the victim of the "Brussels bullies". In one fell swoop, she will unite her cabinet, the party and the nation (or enough of it) behind her. Redolent of Low's famous cartoon, "very well, alone", she can posture on the white cliffs of Dover (physically or metaphorically), waving her fist against the common external enemy. Since any and all serious consequences of a "no deal" Brexit will be put down to deliberate "punishment" by the EU, this will allow her to invoke the contemporary equivalent of the "Blitz spirit", in a further attempt at uniting the nation. The right-wing press, led by the Express will be in its element, while the left, destroyed by the incompetence of Corbyn, will be relegated to sulking impotently on the sidelines. The tougher it gets, the better it will get for the Tories who, in the general election in 2022, will sweep to victory on the ticket: "we can take it". A stirring campaign, on Churchillian lines, will offer nothing but "blood, toil, sweat and tears". Determined to "make Britain great again", the victorious prime minister will pledge to build a vast new global trading empire, to make up for the loss of almost the entire volume of EU trade. Needless to say, such a scenario is entirely speculative. It has minimal evidential support and such information that we do have is equivocal. And yet, we are in a situation where Mrs May has nowhere to go with the talks, with a concerted campaign building to convince the public that the "no deal" scenario is a plausible, if not tolerable option. With flag-waving distractions on offer, such as a UK alternative to the EU's Galileo sat-nav system, and high profile - if meaningless - trade deals with African countries (replacing only that which we already had via the EU), it will be easy for some to believe that we can make our way without a deal with Brussels. Who needs car and aviation industries anyway? 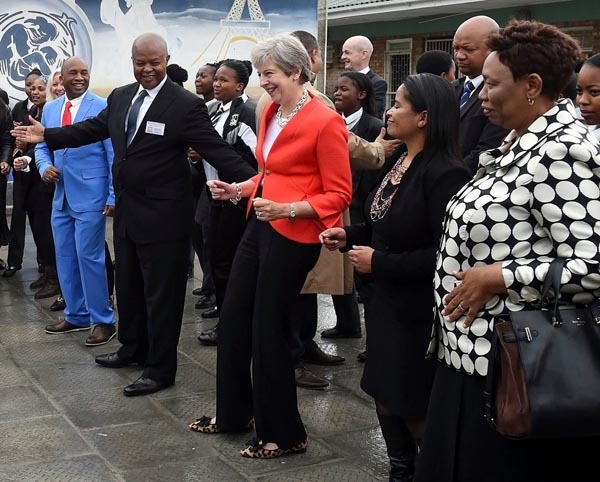 All Mrs May has to do is dance her way round the African continent, and perhaps seek pole-dance bookings in Moscow and Peking. With such moves, and the media behind her, anything is possible. How can the EU even begin to compete?